Pops & Me. Cheering on our girl at a recent volleyball tournament. He has no business loving me. The very idea of me could easily inspire a Bitter Party For One. I wouldn’t even blame him. I am not an answer to his prayers. Here we are at Mother’s Day. I’m the one being celebrated. I’m the one who gets the joy, privilege, and honor of raising his only grandchild. The man we call, “Pops,” has experienced more loss than one person should bare: his first wife and both his adult children passing within a few years of each other. Left behind–only him and his precious young granddaughter. Twist the knife again as that sweet little girl left his custody after his daughter died and went to live full-time with his former son in-law. I can only imagine in his pain, his grief, his loss the last person he was hoping for was me. A California-raised, outgoing, somewhat zany lady who is not of his faith. A faith that is everything to him. A faith that has sustained him through all these tragedies. It is I who showed up three years after his daughter passed. I, who married his former son in-law. I, who adopted his granddaughter. I, who became a mom after his daughter left soon. How easily he could resent me. Together, we share endless, over-flowing hearts fueled by love for our girl. In Pops, I have found a co-conspirator in the cookie jar. I thought I had a naughty sweet tooth. Pops has a sweet tooth that could put Willy Wonka to shame. To dine with Pops means to enjoy the best desserts possible. From him I’ve learned the importance of topping just about every dessert with a side of vanilla ice cream. “Knocks the sweetness down a notch,” he winks. 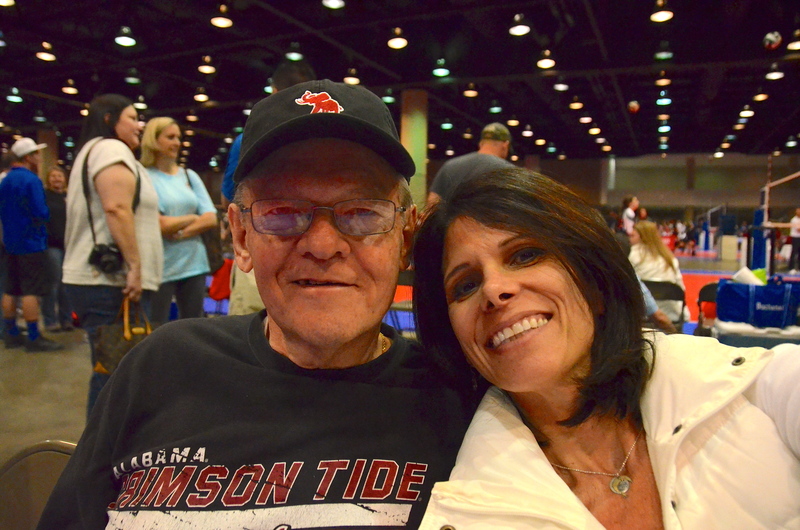 In Pops, I’ve learned to roll with the tide, as in “Roll Tide Roll,” as in Alabama Football. As in a passion for a team that runs close behind his love for his God, is beloved second wife, and yes, his granddaughter. My own sports-loving college football obsessed father must’ve been smiling down the first time Pops treated me to a home game in Tuscaloosa. Turns out, my dad passed away the same year as Pops’ daughter, my daughter’s first mother. Ironic how things like that happen. In the pain of the moment, you can’t see who might be on their way to you. Wouldn’t have mattered if someone told either of us. The story so far-fetched neither would’ve believed it. Somehow, in a potentially stressful, awkward situation where things could’ve gone terribly wrong, we, two imperfect people, have both managed to show up as our best selves. I never forget how painful it must be to see another woman raising his daughter’s child. He seems to find any occasion to thank me for being a great mom to his granddaughter. I’m no replacement for his daughter, as he is no replacement for my dad. I share this, Dear Reader, to say that I have come to know that amid all the flowers, candy, joy and expressions of unconditional love we mothers are showered with this special day, there is someone out there who is not having the Mother’s Day they wished. It’s the thing no one really talks about when families break. They all have a way of robbing what some deserving soul wishes for this Mother’s Day. If that’s you—If Mother’s Day is not as you wished this year, know that I’m thinking about you. Just like I’m thinking about Pops, knowing that he wishes it was his daughter who was here to celebrate. I get it. That’s fair. I also know I’ll hear from him wishing me a Happy Mother’s Day. Oh, you know that’s going to take my breath away–that a man who has lost so much can open his heart one more time for me. Oh, you know we will be celebrating both my daughter’s mothers this Mother’s Day. Oh, you know there will be some awesome dessert. And oh, yes, indeed we’ll knock it down with a side of vanilla ice cream. Please catch my newspaper column each week in the Atlanta Journal Constitution, the Dayton Daily News and other newspapers across Ohio. Daryn, that was a beautiful tribute to so many … Happy Mother’s Day. Daryn, you covered a lot of ground telling that story. What a wonderful blog entry! Thanks for sharing that! I know Pops … he is a remarkable man indeed. What a wonderful tribute. God bless both of you for taking tragic, challenging circumstances and making it work!